WASHINGTON— A coalition of more than 400 organizations and leaders will deliver a historic letter to the White House on Tuesday calling on President Obama to stop new federal fossil fuel leasing on public lands and oceans in the United States. 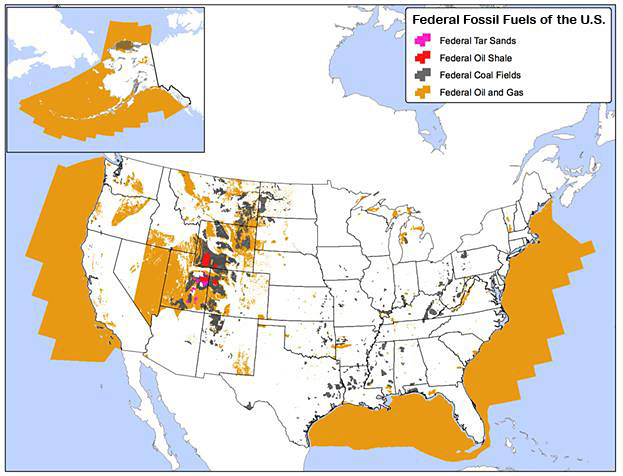 Federal fossil fuels of the United States. Map by Curt Bradley, Center for Biological Diversity. Download the signed letter here. Download Grounded: The President’s Power to Fight Climate Change, Protect Public Lands by Keeping Publicly Owned Fossil Fuels in the Ground here (this report details the legal authorities with which President Obama can halt new federal fossil fuel leases). Download The Potential Greenhouse Gas Emissions of U.S. Federal Fossil Fuels here (this report quantifies the volume and potential greenhouse gas emissions of remaining federal fossil fuels).